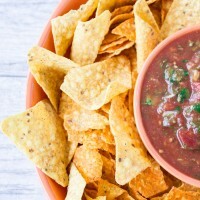 This restaurant style Mexican salsa is the ultimate dip and sauce when you’re looking to snack or jazz up any Mexican dish! It’s packed with fresh ingredients and flavors and you won’t believe how easy it comes together : 5 minutes in your food processor! You don’t need a restaurant anymore to have real authentic restaurant style Mexican salsa! I make salsa all the time, now this is one recipe I love twisting around and around with many different variations..but today let’s start with the classic basic restaurant style Mexican salsa. I use this salsa as a dip or as a sauce for fish, chicken, meats, veggies, quesadillas, sandwiches and much more.. I used to always chop and dice all my ingredients until one day, one really busy day I had to make a huge batch of my awesome nachos in 10 minutes—and that’s when I took the risk of trying a food processor for my salsa. Oh how I was super pleasantly surprised! It came together beautifully, in just 5 minutes and I was still in control of how chunky I like my salsa. There are a couple of tips and a secret ingredients in my opinion that take this salsa to another level! For best texture, I start processing the scallions, garlic, jalapeño (if you want a kick to it! 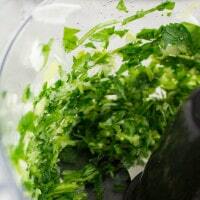 ), half the cilantro and parsley first. 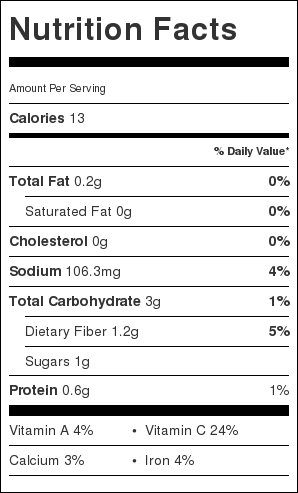 This really gives you much control of the tomatoes texture and the final texture of the salsa. I use whole canned tomatoes for my salsa (good quality San Marzano tomatoes are best), then add spices, lime juice, remaining cilantro and parsley, and my secret ingredient : a little bit of ketchup! Yes I said ketchup. I know its not Mexican, or even close. But oh my does this ingredient make a difference to your salsa! It tones down all the strong flavours and adds just a hint of sweetness that balances the acidity of tomatoes and lime juice. And it also adjusts the consistency of the salsa and binds it together to a much smoother homogenous consistency – much like a real restaurant style Mexican salsa should be! Place the scallions, garlic, 1/4 cup each of the parsley and cilantro and the jalapeño in a food processor and pulse a few times until they are finely minced. 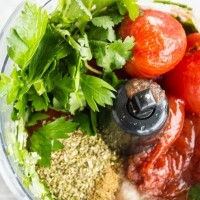 To the same bowl of the food processor, add the whole can of tomatoes (juices and tomatoes), along with the spices and remaining ingredients. Pulse again a few times and check the texture after each pulse to make sure it doesn’t go too smooth. Stop at the perfect chunky level you like, taste and adjust seasoning, and serve. 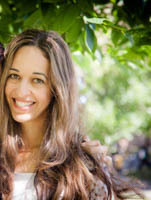 Caitlin–you won’t believe the difference it will make to your salsa!! I urge you to try it! I just made a batch of breakfast burritos. This salsa is going to be amazing with them! So delicious! 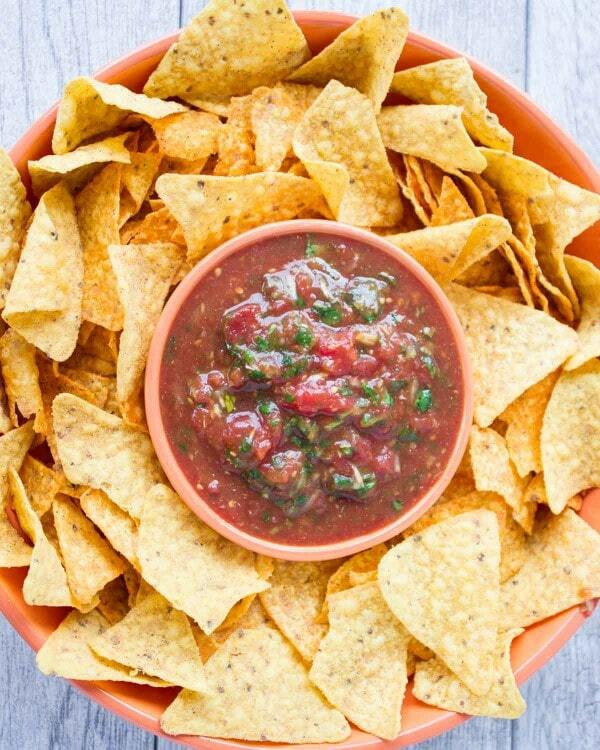 I could eat chips and salsa every day! I know what you mean Brandy! I could eat a whole bowl of this salsa! The best is homemade! 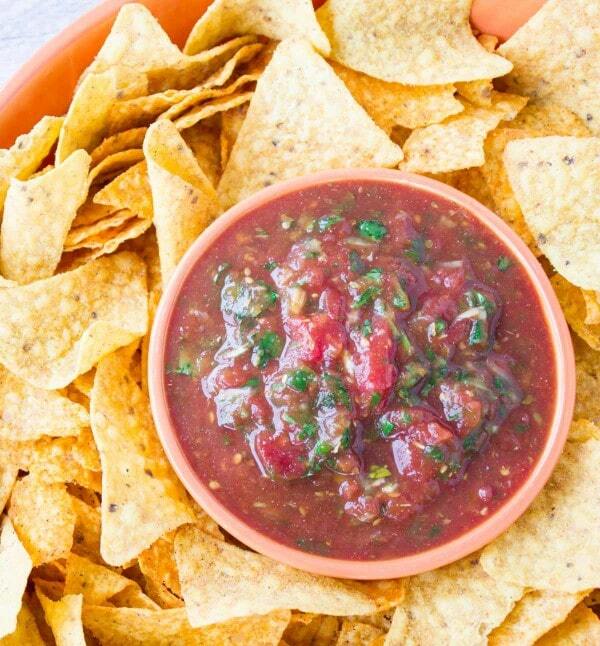 I absolutely love restaurant style salsa. I love, even more, being able to make my own! This looks delish! I really love how easy this is to make! Looks so good! 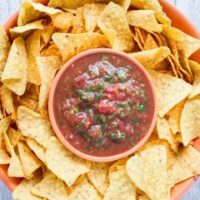 I love quick and easy to make salsa! I can’t wait to give this a try!